Endennasaurus acutirostris, an Askeptosaurian thalattosaur from the Late Triassic of Tethys Italy, Illustration by Nobu Tamura (Wikipedia). Thalattosaurs were only one of a number of diverse groups of marine diapsid reptiles that evolved in parallel during the Triassic period. Thalattosaurs (meaning "ocean lizards") are marine diaspids of uncertain affinities. They resembled large (upto two to four meters or more in length) aquatic lizards, with long, flexible bodies and short but stocky limbs (see Zachary Miller When Pigs Fly Returns). They were among the more successful of the Triassic marine reptiles, and evolved along a number of distinct lines, although all appeared to be near-shore types, like the contemporary early ichthyosaurs, pachypleurosaurs, nothosaurs, helveticosaurs, proto-turtles, and trematosaur amphibians and other animals they shared the marine environment with. Miodentosaurus brevis, a thalattosaurian from the Late Triassic of China, Illustration by Nobu Tamura (Wikipedia). 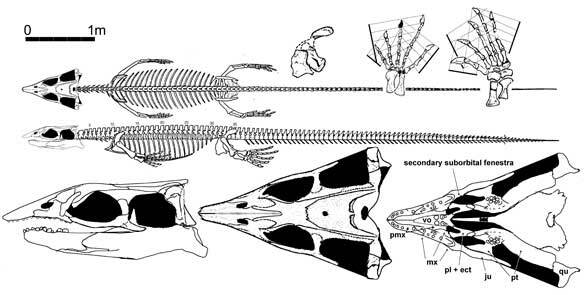 Although this reconstruction shows a tail fin (see also ) it is equally possible that the tail was long and tapering like that of a modern marine iguana. Comments: The terminology varies, with the larger thalattosaur-askeptosaurid group being called either Thalattosauria (Cheng et al 2007) or Thalattosauriformes (Müller et al., 2005), whilst the name Thalattosauroidea has been used for the more exclusive thalattosaur group (Rieppel et al., 2000). Middle (Anisian/Ladinian) to Late (Carnian) Triassic of Europe and China. Reconstruction of skull and skeleton of Askeptosaurus italicus. The original animal was about 2 meters long. Drawing copyright © David Peters - Reptile Evolution - original url, reproduced with permission. Middle Triassic (Anisian/Ladinian) of central Europe. Reconstruction of skull and skeleton of Miodentosaurus brevis from the late Triassic of China. From the scale bar (see also photo) the original animal was about 5 meters long, which makes it among the biggest of the Thalattosaurs. 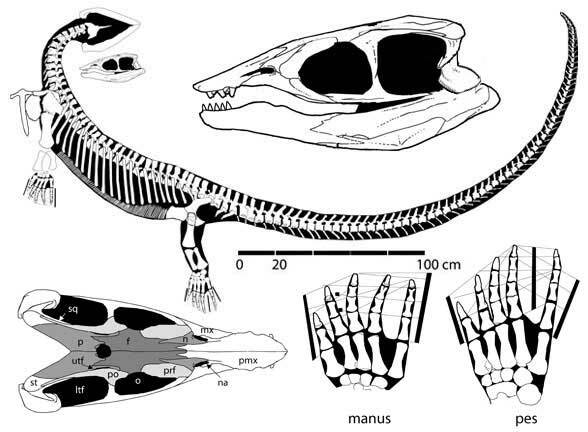 Note, the skull at the lower left is too narrow, compare with photo (previous link). Drawing copyright © David Peters - Reptile Evolution - original url, reproduced with permission. Late Triassic (Carnian) of China. Comments: Differs from Askeptosaurus in having a much shorter rostrum and fewer teeth. Late Triassic of Tethys Europe. 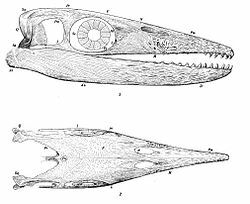 Comments: a specialised, toothless form, similar to Askeptosaurus, but with a longer toothless jaws. Reconstruction of skull and limbs of Thalattosaurus alexandrae , from the Carnian of California. 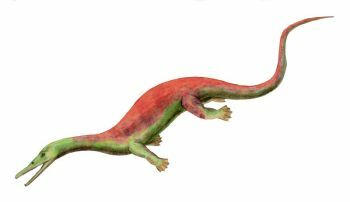 The original animal is estimated at about two meters long. Drawing copyright © David Peters - Reptile Evolution - original url, reproduced with permission. Early/middle (Olenekian/Anisian) to Late (Carnian) Triassic. Reconstruction of skull and skeleton of Clarazia schinzi. The original animal was about a meter long. Drawing copyright © David Peters - Reptile Evolution - original url, reproduced with permission.